This special technique can be practiced anytime, anywhere except when you are driving or otherwise engaged in an activity that requires your full attention and concentration. It will help you to restore a sense of peace and calm almost instantly. It is especially useful when you are feeling tense, nervous or very anxious. It can also be put to use by you during panic attacks. This is however not a substitute for medical diagnosis and treatment, especially with regard to chronic ailments or disorders. 1. Seat yourself comfortably on a chair or sofa. 2. Preferably, do not cross your hands or legs. 4. Hold the breath within till another count of 5. 6. Pause breathing till another count of 5. 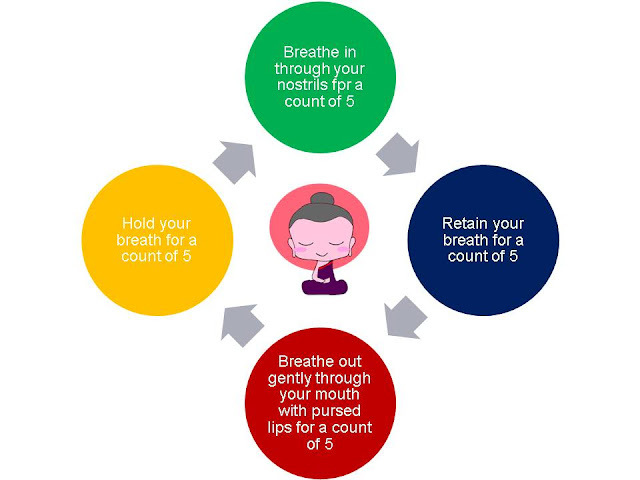 Continue for 1-5 minutes or until you feel a sense of calm pervading all over you. You can do this anytime during the day whenever you feel the need to do so.